Were Hiroshima and Nagasaki; The Greatest Acts of Christian Terrorism in Human History? The blessed bomb; was delivered in a mission blessed by a Christian-Catholic priest in a bombing that decimated and slaughtered hundreds of thousands of men, women and children. The city of Hiroshima stands on a flat river delta on the Japanese island of Honshu. At quarter past eight on the morning of 6 August 1945, the US plane Enola Gay dropped an atomic bomb on the city centre, a busy residential and business district, crowded with people going about their daily business. The bomb, called ‘Little Boy’ because of its long, thin shape, was made from uranium 235. Unimpeded by hills or natural features to limit the blast, the fireball created by that single bomb destroyed 13 square kilometres of the city. The heart of the explosion reached a temperature of several million degrees centigrade, resulting in a heat flash over a wide area, vapourising all human tissue. Within a radius of half a mile of the centre of the blast, every person was killed. All that was left of people caught out in the open were their shadows burnt into stone. Beyond this central area, people were killed by the heat and blast waves, either out in the open or inside buildings collapsing and bursting into flame. In this area the immediate death rate was over 90 per cent. The firestorm created hurricane-force winds, spreading and intensifying the fire. Almost 63 per cent of the buildings of Hiroshima were completely destroyed and nearly 92 per cent of the structures in the city were either destroyed or damaged by the blast and fire. The total number of deaths was hard to establish, but at least 75,000 died in the first hours after the bomb was dropped, with around 140,000 dead by December 1945. The death toll reached around 200,000 by the end of 1950. Many of those who survived the immediate blast died shortly afterwards from fatal burns. Others with possibly less-fatal injuries died because of the breakdown of rescue and medical services, much of which had been destroyed, with personnel themselves killed. Within two or three days, radiation victims who were near the hypocentre developed symptoms such as nausea, vomiting, bloody diarrhoea and hair loss. Most died within a week. Radiation victims further away from the explosion developed symptoms one to four weeks after the explosion. 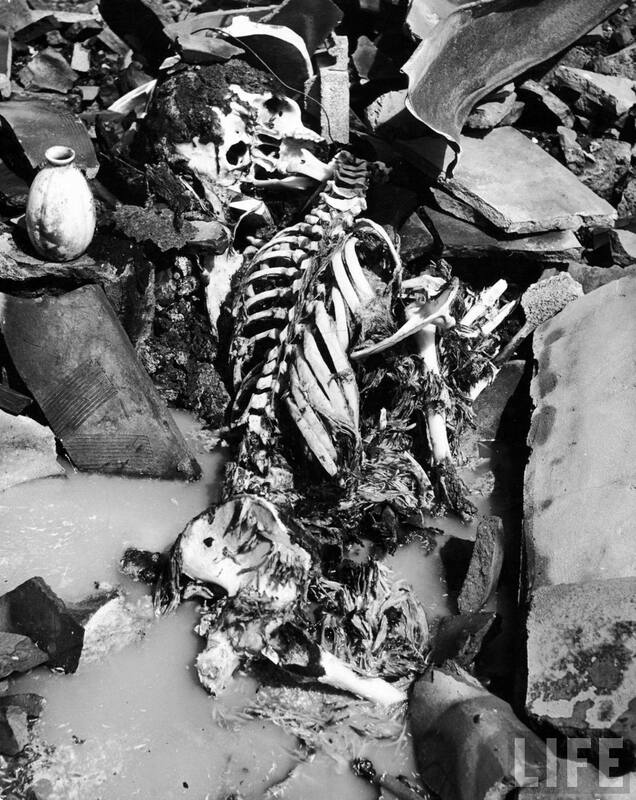 Pregnant women who survived the bomb faced additional horrors, for the bomb had a terrible impact on a foetus. Many were stillborn, but those born alive faced higher infant mortality rates than normal, or had abnormally small skulls, often suffering from mental disabilities. From about 1960 a higher rate of cancer became evident, in particular of the thyroid, breast, lung and salivary gland. Radiation is known to cause many types of cancer, and Japanese scientific research has now shown a direct correlation between the distance from the atomic bomb hypocentre, the probable exposure dose of radiation and cancer rates. Conventional wisdom – especially in the US – about the dropping of the atomic bomb on Hiroshima, and three days later on Nagasaki, is that it was necessary in order to bring about a speedy conclusion to the war and save lives. Even today many people genuinely believe that the bomb was necessary to bring about a Japanese surrender and to avoid the need for an invasion of Japan by the US, which might have cost hundreds of thousands of lives. But extensive scholarly research in the US, using primary sources from the time, shows that this just wasn’t true. So if Japan was ready to surrender, why were atomic bombs dropped on Hiroshima and Nagasaki? A significant factor in the decision to bomb was the US’s desire to establish its dominance in the region after the war. Those planning for the postwar situation believed that this required US occupation of Japan, enabling it to establish a permanent military presence, shape its political and economic system and dominate the Pacific region without fear of Japanese resurgence. But Japanese resurgence was no longer the US’s key strategic concern; its main concern, above all, was the Soviet Union. The Soviet Union was the US’s wartime ally against Germany. But ultimately, of course, their economic systems were incompatible; the US would not accept that any part of the world economy should be closed to it and those seeking an alternative to the market economic model of the US tended to look to the Soviet Union. This looming antagonism was heightened by the increased power and prestige of the Soviet Union following its role in breaking the back of Germany’s military machine. The US consequently wished to prevent a Soviet advance in Asia and subsequent Soviet influence on Japan. One is forced to conclude that the US wanted to demonstrate its unique military power – its possession of the atomic bomb – in order to gain political and diplomatic advantage over the Soviet Union in the postwar settlement in both Asia and Europe. Whilst many leading US politicians, diplomats and military figures thought it unnecessary to bomb Japan, the group around the US’s president at the time, Harry S Truman, pressed strongly for it. Secretary of War Stimson, for example, described the atom bomb as the ‘master card’ in US diplomacy towards the Soviet Union. Other claims made by the US to try to further justify the use of the bomb have also been shown to be false. For example, it was claimed that the citizens of Hiroshima and Nagasaki were warned, by the dropping of leaflets, what was going to happen and urged to evacuate the cities. This is simply not true. Evidence shows that the decision was taken at the highest level not to give any prior warning. Leaflets were dropped on Japanese cities, but they were dropped after the atomic bombings, warning that further resistance would be useless. It was also claimed that Hiroshima and Nagasaki were legitimate military targets. Again, this just wasn’t true. Hiroshima was home to the Japanese Second Army HQ, but it was primarily a big city with a huge civilian population. About 10,000 of the total 200,000 deaths in Hiroshima were military personnel. 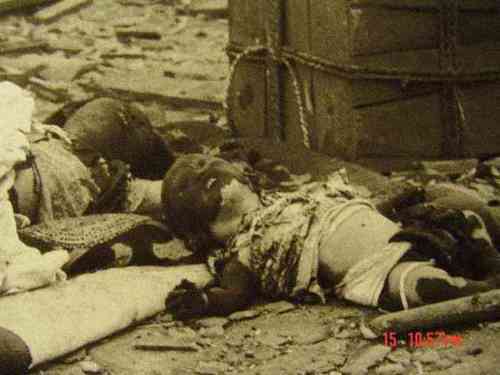 Nagasaki had no military units and, of the total 140,000 deaths there, only about 150 were military. In total, over 95 per cent of the combined casualties of the two cities were civilian. As well as securing political, diplomatic and military advantages for itself, the US also secured the otherwise impossible opportunity of testing its nuclear weapons on human beings, and determining their impact on buildings and other materials. The US was also able to monitor the impacts of radiation on humans in a way that would otherwise have been impossible. In dropping two bombs, one of uranium and one of plutonium, in different physical settings, a variety of effects could be tested. As the decades pass since the terrible war crimes at Hiroshima and Nagasaki, we must never forget what happened and the cynical and barbaric opportunism of the US in using those weapons.